The National Freedom Front today (Mar. 01) staged a protest and handed over a petition against British foreign secretary David Miliband?s participation in a pro-LTTE conference in London. Led by party leader Wimal Weerawansa, the NFF demonstrated in front of the British high commission in Colombo. 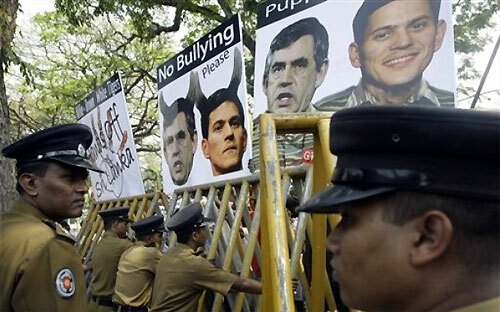 The petition addressed to prime minister of Britain Gordon Brown voiced utmost protest and condemnation of Mr. Miliband's attendance at Global Tamil Forum, where he commended its objectives. Quoting from the British foreign secretary's remarks on the occasion, the letter alleged he was trying to intervene in internal affairs of a country in support of LTTE terrorism. The letter added that Sri Lanka does not wish to have another separatist civil war in the country.